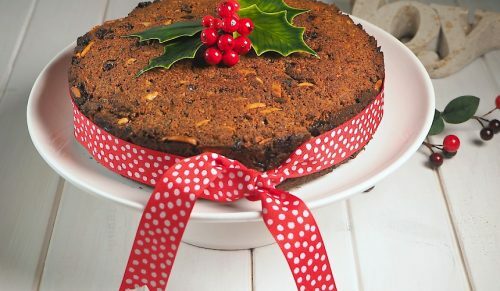 A deliciously moist and healthy Christmas Cake. There is no need to add honey or sugar to this recipe, as the dried fruit is full of natural sugars. I’ve used chia seeds to add healthy fats, protein and fibre to the cake, chia also helps keep your blood sugars balanced. The addition of hazelnut meal gives a lovely sweet, nutty and rich full flavour. You can also use this recipe as a pudding, just reduce the cooking time by 10-15 minutes. There is nothing more rewarding than placing your own homemade cake in the centre of your Christmas Table. Add the orange zest, orange juice and chia seeds to a large bowl. Mix well to moisten the seeds. Add the dried fruits, filtered water, vanilla, cinnamon, ginger and allspice to the chia mixture and mix well. Allow to sit for 15 – 20 minutes. Meanwhile, preheat oven to 150c (fan-forced). Line the base and sides of a 20cm round spring-form cake tin. Add the lightly whisked eggs to the bowl and stir them through the fruit and chia mixture. Pour in the melted coconut oil that has slightly cooled (you don’t want to cook the eggs), and mix well. Add the baking soda and salt to the bowl and stir through. Add the almond and hazelnut meals and slivered almonds. Stir to combine the mixture well. Spoon the mixture into the prepared cake tin and spread out evenly. Bake for 1 hour and 50 minutes or until a skewer inserted comes out clean. Turn twice during cooking for even colour (if you find the top is over-browning you can place a loose sheet of foil or baking paper on top). Allow the cake to cool in the tin for 30 minutes, then release the sides and let the cake completely cool. You can bake the cake up to 8 weeks prior to Christmas, stored in an airtight container in the fridge. Serve on a plate or cake stand and decorate with some Christmas trimmings. Note: I like to make individual plum puddings from this recipe. Line or grease a large muffin tray, fill and press the mixture into the cups. Bake for approximately 45 minutes. Store as above, also suitable to freeze for up to 6 months. Serve with this delicious Caramel Sauce.